Stephen Hawking's Beliefs about God. 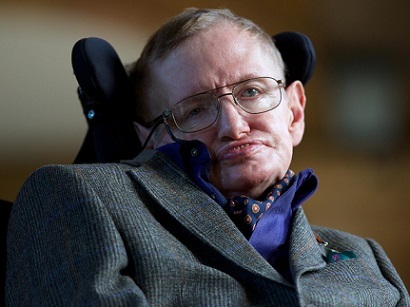 Stephen Hawking, CH CBE FRS FRSA the world renowned English theoretical physicist, cosmologist, author, and Director of Research at the Centre for Theoretical Cosmology at the University of Cambridge, was born on 1942-JAN-08 in Oxford, UK. He died at the age of 76 during the early morning of Wednesday, 2018-MAR-14. He described himself as being an Atheist. His family released a statement that morning that confirmed his death in his home in Cambridge, MA -- the location of both Harvard University and Massachusetts Institute of Technology (MIT). "We are deeply saddened that our beloved father passed away today. He was a great scientist and an extraordinary man whose work and legacy will live on for many years. His courage and persistence with his brilliance and humour inspired people across the world. He is survived by his first wife, Jane Wilder, from whom he was divorced; his second wife, Elaine Mason from whom he was also divorced; three children: Lucy, Robert, and Timothy Hawking, and one grandchild, William Smith. His life span was only about two and a half years shorter than the average for a male in the U.S. (78.7 years). This is in spite of having contracted the profoundly limiting fatal disease called Amyotrophic Lateral Sclerosis (a.k.a. ALS, Motor Neurone Disease, MNS, or Lou Gehrig's Disease). ALS causes nerve cells in the brain and spinal column lose their ability to control muscles throughout the body. It affects both women and men in about equal percentages. Its cause is currently unknown. 3 There is no cure. He was diagnosed with ALS in 1973 when he was in his very early 30's, and was given a life expectancy of a few years at that time. He persevered an unusually long time, almost a half century after diagnosis. In recent years, his paralysis was almost complete. He was only able to move the fingers of one hand. His death happened on the same month and day as Albert Einstein's birthday. March 14 is sometimes shown as 3/14, and is sometimes called Pi Day, because 3.14 are the first three digits of the number Pi -- the ratio of the circumference to the diameter of a perfect circle. "God may exist, but science can explain the universe without the need for a creator." "I believe the simplest explanation is, there is no God. No one created the universe and no one directs our fate. This leads me to a profound realization that there probably is no heaven and no afterlife either. We have this one life to appreciate the grand design of the universe and for that, I am extremely grateful." "God is the name people give to the reason we are here. But I think that reason is the laws of physics rather than someone with whom one can have a personal relationship." On the afterlife: "I regard the brain as a computer which will stop working when its components fail. There is no heaven or afterlife for broken-down computers. That is a fairy story for people [who are] afraid of the dark." On life: "I have lived with the prospect of an early death for the last 49 years. I’m not afraid of death, but I’m in no hurry to die. I have so much I want to do first." "We are just an advanced breed of monkeys on a minor planet of a very average star. But we can understand the Universe. That makes us something very special." "The greatest enemy of knowledge is not ignorance, it is the illusion of knowledge." On Intelligence: "Intelligence is the ability to adapt to change." On predestination: "I have noticed [that] even people who claim everything is predestined, and that we can do nothing to change it, look [both ways] before they cross the road." On Science: "Science is not only a discipline of reason but, also, one of romance and passion." The most common, popular definition of the word "Atheist" is a person who actively denies the existence of a supreme being, or God. The image comes to mind of a man standing on a soapbox in a public park, waving his arms, and stridently declaring his beliefs. However, Atheists themselves generally define the word as implying that the person simply has no belief in God. Under that definition, just about everybody could be considered an Atheist: Very few people alive today have any belief in the ancient goddesses and gods. For example: few believe in Aphrodite, Baal, Fergus, Mithra, Venus, Zeus, etc. This is a command for everyone to be an Atheist, in that they are to believe that of the 6,000 or so deities worshipped by humans now and in the past, all but one -- the Judeo-Christian God -- does not exist. Most major polling agencies who have recently estimated the number of adult Atheists in the U.S., have arrived at values between 3% and 11%. Unfortunately, these numbers are certainly underestimates, because they are based on randomly selected individuals who were asked over a telephone by a stranger about their religious beliefs. With the current level of animosity towards Atheists, most of them seem to be are unwilling to admit their beliefs to a polling agent. W.M. Gervais and Maxine B. Najle have designed a complex and innovative polling method to determine the actual number of Atheists in the U.S. They estimate 26%, slightly more than one in four of the adult population. 5 With the current decline of Christian affiliation in the U.S., that percentage is probably increasing. He once said that it was natural for humans to believe in God during a pre-scientific era. However, today, science has now provided better answers about the universe, the afterlife, and deity/deities. "It would be the ultimate triumph of human reason –- for then we should know the mind of God." Some Christians and other theists focused on this quote and suggested that Hawking actually did believe in God. But in his subsequent book "The Grand Design" he clarified that he had intended the statement to be interpreted metaphorically. "Stephen Hawking's quotes," Brainy Quote, 2018, at: https://www.brainyquote.com/ and other sources. Image from The Independent. In the public domain.